Scientists are beginning to unravel the wind patterns on Titan. After more than six years, it appears that the Mars rover Spirit has finally died. The rover was originally designed to only operate 90 days. An evening pause: We’ve had animated machines and actors pretending to be machines. Now, let’s have a Rube Goldberg machine. Who are the racists? Readers (and one former editor) respond with dismay because Essence magazine has hired a fashion editor who happens to be white. Law of unintended consequences strikes again. The new healthcare law has a provision, unrelated to healthcare, that involves a paperwork nightmare for small businesses. A political note: my Congressman happens to be Steny Hoyer, who waxed poetic recently about taxes and the coming expiration of the Bush tax cuts. Hopefully, this man will free Hoyer from such concerns. The space war over NASA continues. The pushback from commercial space advocates and industry proponents seems to be having an effect. House aides have indicated that the House NASA authorization bill will not be voted on until September. The Japanese space agency JAXA has put Hayabusa’s heat shield, outer capsule, and parachute on public display, to large crowds. Mars Reconnaissance Orbiter takes a picture of the non-face on Mars. An evening pause: Not only does Eddi Reader probably have one of the most beautiful voices in the singing world today, she links that voice to some of the best Irish instrumentalists in the game. Watch her and her band bring down the house in this live performance of “Willie Stewart”. The space war continues. Jeff Foust has two reports today on the political state of NASA’s budget. First, Congress has approved language that requires continuing funding of Constellation. Second, it looks like the House may vote on the new NASA authorization bill this week. The Mars rover Opportunity has spotted its first dust devil after six-plus years of travel. CONGRESS BLOWS IT: Commercial Spaceflight, We Have A Problem. Congress will always choose short-term pork over long-term development unless there’s strong Presidential leadership. But while the Obama space policy is good, the White House hasn’t provided the kind of legislative push it takes to make it work. Without strong leadership, a good policy will always lose out to pork. Didn’t someone say this already? In fact, didn’t that someone say this more than once? An evening pause: Yesterday we had a modern animation of a machine that made music. Tonight let’s watch a very different take on a vaguely similar idea, this time to produce comedy. This is a classic skit from Your Show of Shows, Sid Caesar’s variety show from early television. The four performers are, left to right, Sid Caesar, Imogene Coco, Carl Reiner, Howard Morris. Two NASA probes, originally launched to study the Sun and having completed their mission, have had their orbits adjusted so that they can study the Moon instead. Radar images from Lunar Reconnaissance Orbiter appear to show deposits of approximately 1.6 trillion pounds of water ice on the Moon. The space war continues. Congressman Frank Wolf (R-Va) of the House Appropriations committee says that there is little chance the NASA budget will be approved until January. An evening pause: Though it might look real, the music machine in this short is animated, a creation of Animusic, a company dedicated to producing animated shorts set to music. Update: Japanese scientists have now announced that they have been able to adjust Ikaros’s attitude using sunlight. Another update: Ben Diedrich emailed me the link to read the actual proceedings from the conference. See pg 103 to read the paper on using solar sails to deflect Apophis. An experiment flown in space for 10 days by the European Space Agency has found that three species of lichen can survive the hazards of outer space. End of the world alert! Scientists have identified an almost half mile wide asteroid with a 1 in 1000 chance of hitting the Earth in 2182. During a spacewalk at ISS yesterday, two Russian cosmonauts successfully replaced a broken camera and installed new wiring for the recently added Russian Dawn module. They also lost a washer and an “attachment fixture” used to fasten the wiring in place, both of which were spotted floating away. The General Accountability Office has ruled that the Obama administration’s decision to require contractors to reserve money for the possible termination of the contract, thereby forcing them to cut back early on the Constellation program, was legal. An evening pause: Here’s some modern music, Poker Face, performed not by its original singer, Lady GaGa, but by Molly Lewis, someone far more appealing. A cave exacavation in East Timor has uncovered the bones of the largest rat species on record, weighing over 13 pounds and living approximately one to two thousand years ago. The dig also uncovered 11 previously unknown rat species. I estimate it is 60 meters from rim to bottom. The floor is flat below the surface. The rocks on the flat surface below ground are in stark relief (hard shadows) compared to above ground due to the sun coming only at one angle while above ground the albedo/reflections makes for soft shadows at this high sun angle (65 deg elevation). I cannot tell if the black portion of the combo image is a slope or more flat floor. Need a different high sun angle or azimuth to fill that in. Still I like the general pattern of the rim matching the shadow on the floor, although the image I found originally has that edge of the cave rim in shadow for a large extent. A 60 meter drop is about 200 feet deep. 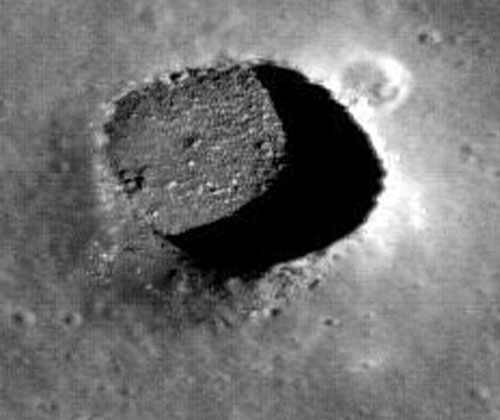 This result is reasonably close to the depth estimated by Japanese scientists, 88 meters or 288 feet, based on images of the same lunar pit taken by their Kaguya probe. In its first six weeks of observation, the Kepler mission apparently found almost 150 planets similar in size to the Earth. The results, learned by accident because a talk given by one of the co-investigators was posted on the web, have not yet been officially announced because the project scientists feel a need for additional time to confirm them. Many of these so-called planets might turn out to be false positives, so some caution is in order. On Saturday (July 24) the American Geophysical Union published a paper in Geophysical Research Letters, entitled “Northern Hemisphere winter snow anomalies: ENSO, NAO and the winter of 2009/10.” This paper attempted to explain the unusually cold 2009-2010 winter, with its record snow falls. The authors of the paper made no attempt to explain why these two climate events “combined” this past winter, which in the field of climate change is actually the essential question. What caused it? Moreover, did the deep and extended negative (cold) phase of the Arctic Oscillation (AO) contribute as well, and if so, why did the AO also go negative this winter? And finally, were all these climate events somehow related to the Sun’s unusally long and deep solar minimum? That they didn’t answer these fundamental questions is not surprising. Climotogists have been struggling with them for decades, and to expect this quickly written paper focused on this one climate event — the cold winter of 2009-2010 — to answer them would be unreasonable. In fact, considering the state of our knowledge, it probably is impossible for any paper to answer these questions at this time.